The Grammy hat’s back! 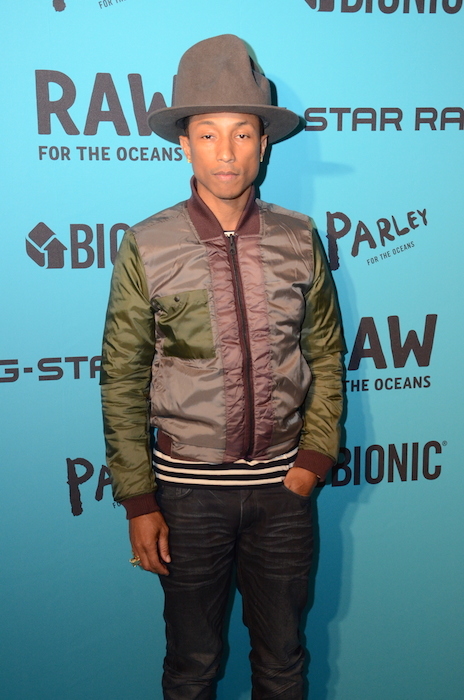 That’s right, Pharrell sported his talked-about Grammy hat at the GSTAR RAW ‘Raw For the Oceans’ event in correlation with NYFW. We at FashionDailyMag had the great pleasure of attending this event, getting a spot on the Blue Carpet with celebs Joe Jonas, Tyson Beckford and Adrienne Bailon. It was a definite highlight to our Fashion Week weekend. The very charming and down to earth Pharrell has collaborated with the denim brand to help make the fashion industry less wasteful. Because of his social status, Pharrell stepped up to the plate to help make a huge difference, becoming the creative director of Bionic Yarn, making a collection made with recycled materials from the ocean. That’s right, yarn made from plastic bottles. Innovative and in good hands…we love it. fdmLOVES PHARRELL at GSTAR Raw For The Ocean NYFW selects by Brigitte Seugra, written by Allison Ripa.